Since 1996, NAHB has been producing reports showing the impact that home building has on the economy of a particular metropolitan area, state, or nonmetropolitan county. In fact, NAHB recently completed its 800th such customized local impact study. The studies have been used to help get individual projects approved, counter anti-growth proposals, or simply generate publicity (for example, for a local parade of homes). For those who only need rough estimates for purposes of illustration, or lack the time and resources to pay the fee and compile the inputs for a customized study, NAHB has traditionally produced a report showing the jobs, income and taxes generated by residential construction in a typical local area, using national average house prices, wages per industry, and tax rates for the inputs. The “typical local” report is available free to everyone on NAHB’s web site. This article reports on the latest, April 2015 update of the “typical local” study, showing the jobs, income and taxes generated by building 100 single-family homes and 100 rental apartments, as well as $1 million of residential remodeling in a typical local area. In the above estimates, jobs are measured in full-time equivalents—i.e., enough work to keep one worker employed full-time for a year, based on average hours worked in each industry. Other details are summarized below. The above estimates were generated from a proprietary model that NAHB developed primarily with data from standard, well-established government sources. The model is comprehensive in that it captures the effects that result directly from the construction activity itself and the local industries that contribute to it, the “ripple” effects that occur as a share of the wages and profits are spent and re-spent, and the ongoing effects of property taxes and the new homes becoming occupied. In the NAHB model, these effects are labelled Phase I, II and III. 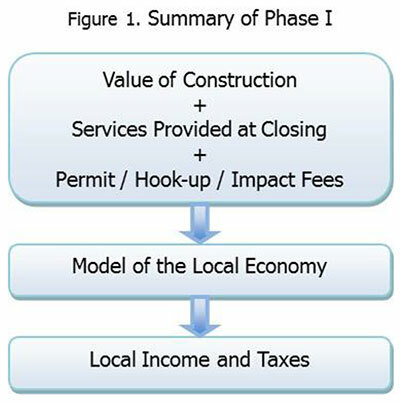 The inputs into Phase I of the model are 1) new home prices minus the value of raw land (the value of construction), 2) closing costs paid by buyer and therefore not technically counted as part of the home price, and 3) any permit, hook-up and other fees paid to local governments as the homes are being planned, developed and built. These inputs are fed into a technology of goods and services that are usually produced by local businesses. The underlying source of this information is the data maintained by the Bureau of Economic Analysis (BEA) for the purpose of generating GDP and related statistics. The model takes a conservative approach, defining fewer than 100 of the roughly 400 industries and commodities available from BEA as local, on the theory that manufactured any many other goods and services are not in most cases produced by local businesses. The increased activity in these businesses generates income for residents and revenue for governments in the local area (Figure 1). In Phase II (the construction ripple effect), some of the income earned in Phase I is spent locally (for example, at a grocery store or fitness center). NAHB estimates how much the average household spends locally with data from the Consumer Expenditure (CE) survey (conducted by the Census Bureau for the Bureau of Labor Statistics, primarily for the purpose of establishing weights for the Consumer Price Index). NAHB’s CE analysis shows that a typical household purchases 52 different locally produced commodities. 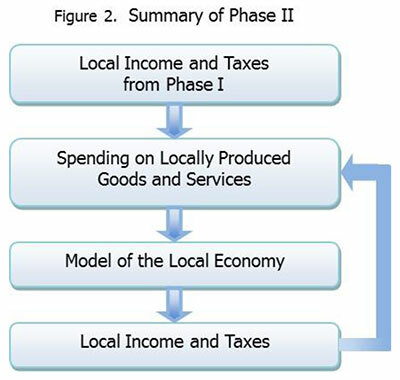 As in Phase I, spending on the locally produced goods and services is fed into the model of a local economy, generating additional local income and taxes. But a fraction of this additional income is also spent locally, generating another ripple of economic activity, which gives rise to yet another ripple, etc. This is illustrated in Figure2, where each time through the bottom three boxes is a successive ripple. The size of the effect in the limit depends on how much leaks out of the local economy (in the form of income saved or spent non-locally) during each ripple. Due in part to conservative assumptions employed by NAHB, the leakage is substantial, and the total effect of all the ripples is less than twice the amount of local spending entering at the top of the figure. Phase III includes property tax payments and the result of a new home becoming occupied and the occupant spending money in the local economy. This doesn’t mean every new home occupant moves in from outside the local area. A household may move into the new home from elsewhere in the same local area, while a household from outside the area moves into the home vacated in the process. Or the new home may allow the local area to retain a household that would eventually have moved out of the area for lack of suitable housing. In either case, the local economy has a net additional household it otherwise wouldn’t have, with average characteristics for occupants of a new home. The NAHB model automatically incorporates normal vacancy rates, which can be especially important in rental properties. Again, the CE survey serves as the basis for estimating spending. A distinctive feature of the NAHB model is the way it estimates income and spending of households depending on the type of new homes they are moving into. There are slightly different versions of the model for single-family housing, multifamily rental, condominiums, housing for residents with restricted incomes (usually under a state or federal subsidy program), housing that is age restricted, etc. Phase III also includes the effect of increased property taxes, based on the difference between the value of raw land and the value of a completed housing unit on a finished lot, the default assumption being that raw land would be taxed at the same rate as the completed housing unit. 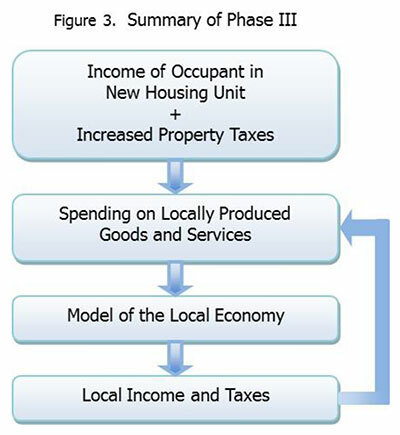 The extra property tax, along with the estimated income of the households and their spending tendencies enter into the model and initiate a series of economic ripples similar to those outlined above for Phase II (Figure 3). The income reported by NAHB in Phase III never includes income of the new home occupants, only the income generated for others in the local area after the new home occupants use some of their incomes to buy local commodities and pay local taxes. While Phases I and II occur one-time, approximately in the year construction takes place, Phase III is an ongoing effect that occurs every year as long as the home is occupied. To fully understand the impact residential construction has on a local area, it is important to include the ripple effects of Phase II and the ongoing effects of Phase III. The new estimates of the jobs, income and taxes generated by new single-family homes, rental apartments in a typical local area were summarized briefly at the top of this article. The full study available on NAHB’s web site contains considerably more detail—including income and employment in 16 industries and local government, as well as detailed information about taxes and other types of government revenue. For example, in Phase I of the analysis for building 100 single-family homes, you can see that 176 of the 237 jobs generated are in construction, 34 are in (wholesale and retail) trade, and 14 are in businesses and professional services, as the bulk of the employment effect is constructing and supplying building products to the new home. In Phase II, 36 of the 157 jobs generated are in the trade sector, 24 are in health education and social services, and 22 are in local government as the local wages and profits are spent in the local economy. And so on. Of course, the estimated impacts depend on certain key assumptions. For single-family homes built in a typical local area, key inputs include an average price of $378,000; which includes $48,000 in raw land value and $13,672 in permit, hook-up, impact and other fees paid to local governments; and an average property tax of $4,239 per year. For rental apartments, the equivalent inputs are an average market value of $145,000; which includes $14,000 in raw land value and $13,672 in permit, hook-up, impact and other fees paid to local governments; and an average annual property tax of $1,626 per apartment. For remodeling in the typical local area, a key assumption is that 1.25 percent of the value of the remodeling job is paid to a jurisdiction in the local area in the form of permit fees. All three sets of estimates also assume that construction materials are subject to a local sales tax of 1.52 percent. The sources for these assumptions is given in the full study. Outside of construction-related fees and residential property taxes, other forms of government revenue are estimated by aggregating line items for all 89,000-plus local governments in the U.S. in the latest Census of Governments. This allows NAHB to preserve the industry structure of income and taxes in BEA’s national accounts while being consistent with the revenue collected by governments in whatever area is being analyzed—usually a metropolitan area, non-metropolitan county, or entire state. This article emphasizes the economic benefits (jobs, income taxes) generated by residential construction in a typical local area. NAHB also maintains a companion model that estimates the governments’ costs of extending services to new homes and compares these costs to the tax revenue estimated in the benefits model, to show how quickly housing pays for itself. A study estimating these costs and comparing costs of new homes to revenue for governments in a typical local area is also posted on the NAHB web site. In addition, NAHB has produced reports that estimate the impact of home building on the economy of an average state, and on the national as a whole. Again, this material is available free on NAHB’s site. The average state benefit and cost reports use essentially the same models and are otherwise similar to the “typical local” studies. The main difference is additional government costs and revenue captured by including the state government—which tends to account for a large share of sales and income taxes collected within a state, supporting a few additional jobs, mostly in the public sector. However, the national model is quite different and should not be used or adapted by someone trying to estimate the impacts of construction within a state or local area. In particular, the published national impacts do not include the equivalent of ripple or ongoing effects (Phases II and III) of the local model. Ongoing effects in the local model are a function of locating a home in one metro area rather than another, and the ability of that area to attract or retain a household because the home is built. This assumption is less obviously appropriate if applied to the entire country. On the other hand, NAHB’s national estimates do include the impact of home building on all industries, no matter where in the country they’re located. Often, in the national context, the upstream impact of construction on manufacturing industries turns out to be of particular interest. Due to the difference in the two models, NAHB strongly advises against trying to mix, match or otherwise combine local and national estimates. Instead, NAHB strongly recommends deciding up front if you’re interested in impacts at the local or national level, pick the appropriate set of NAHB estimates, and stick with it to avoid confusion.